Come on, who doesn’t like mousse? It has to be one of the all-time favorite desserts. “Mousse” is French for frothy or bubbly, with whipped cream usually the main ingredient, and often eggs for added richness. Mousse comes in endless varieties, chocolate being the most common, but fruit mousses are also just as amazing. Mousse is not always sweet; it can also be savory using fish, liver (or other finely ground meat), and poultry. The possibilities are endless! Mousse made its first appearance in a French restaurant in the 1960’s. The original French masters, lovers of cream, realized its potential in cookery, especially in desserts, and sought to improve and strengthen its stability so they could add flavors to it. It didn’t take long for ‘mousse’ to catch on in the United States and the rest of the world. The secret of mousse is the large number of tiny bubbles distributing air throughout the cream (or eggs), which counteracts the fat in the cream, and the stronger taste of eggs. This in turn highlights other flavors of chocolate, fruit, and sugar. 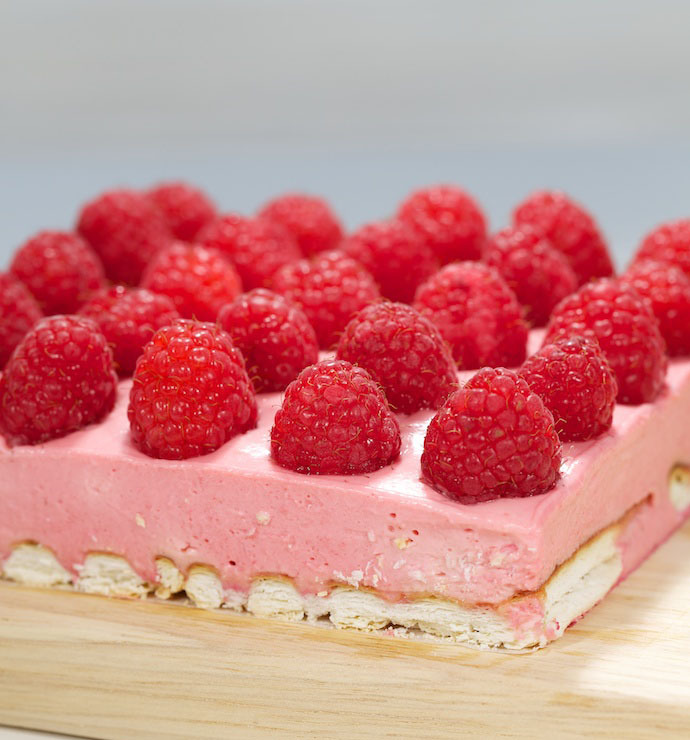 Today I introduce you to Raspberry Mousse Cake. 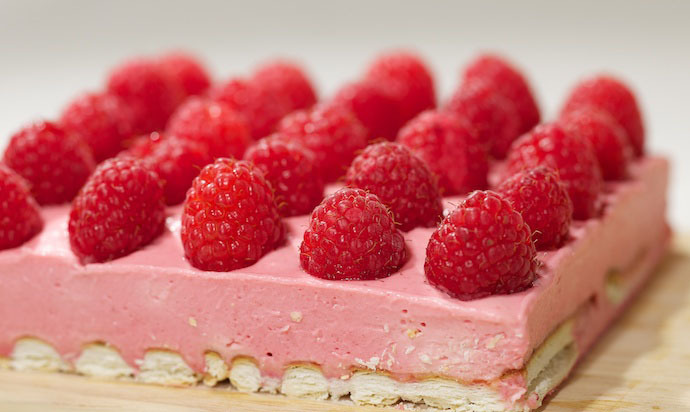 The rich combination of sweet raspberries and cream is absolutely intoxicating! Not to mention the gorgeous color! That’s one of the other great things about mousse – you start with a blank canvas and can produce some very colorful dishes. 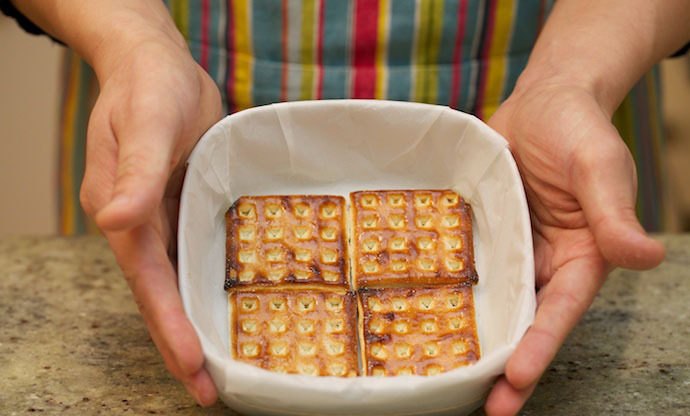 4 cookies of choice, preferably square in shape to fit your chosen dish neatly. You can also trim them to fit if need be. More gelatin can make the cake more firm, but affects the taste. A small amount of vegetable oil to prepare mold. Although this dessert looks gorgeous, making it is dead easy. The first step is to prepare the mold. 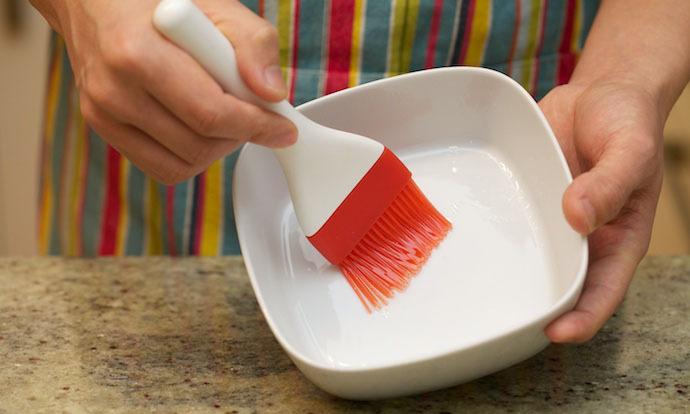 Brush a layer of vegetable oil at the bottom of the mold. Cut a piece of baking paper to fit and overlap about 2-3 cm over the top edges (this will make it easy to remove when the mousse is set). Place the piece of baking paper into the dish and cut the four corners down the sides, so they will overlap. Of course, feel free to skip this step if you wish and place the mousse directly into the dish, but it may be messy pulling it out later. The second step is to prepare the base of the mousse cake. Arrange the cookies on the bottom of the dish and trim to fit if needed. 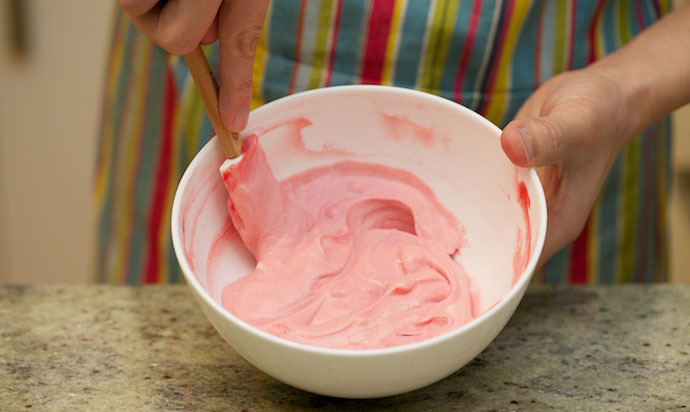 The third step is to make the mousse. 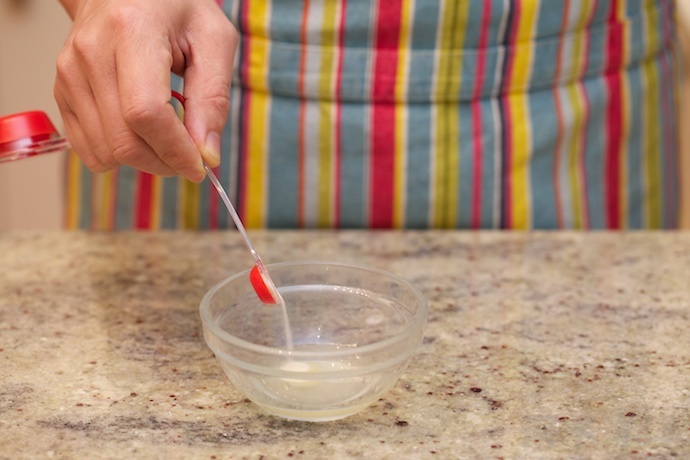 Pour the lemon juice into a small bowl and sprinkle the gelatin powder over the top. It will dissolve fairly quickly, and once it has dissolved put it aside. 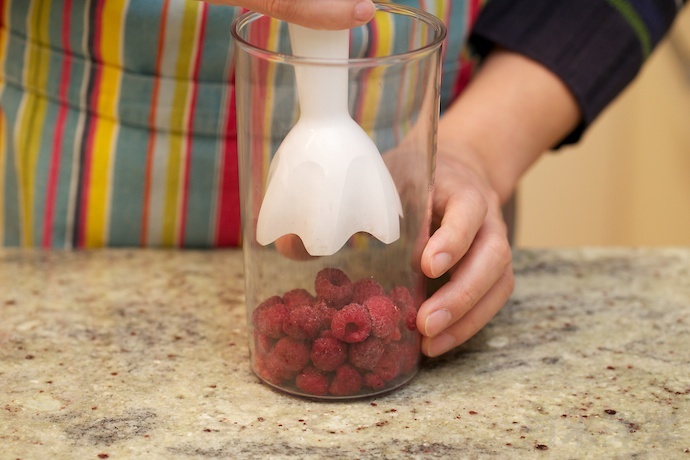 To make the raspberry puree, thaw the raspberries and put them into a blender, or into a tall container and use your stick blender. Strain the puree through a fine sieve to get rid of the seeds. You might have to scrape the bottom of the sieve a few times to ensure it all goes through. Just look at that color! 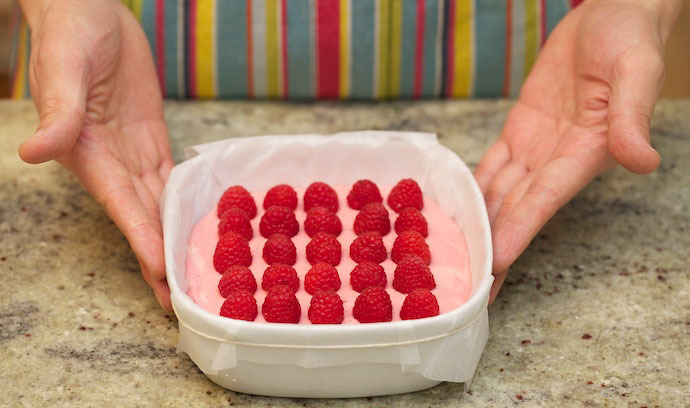 150 grams of frozen raspberries should produce at least 70 ml of strained of puree. 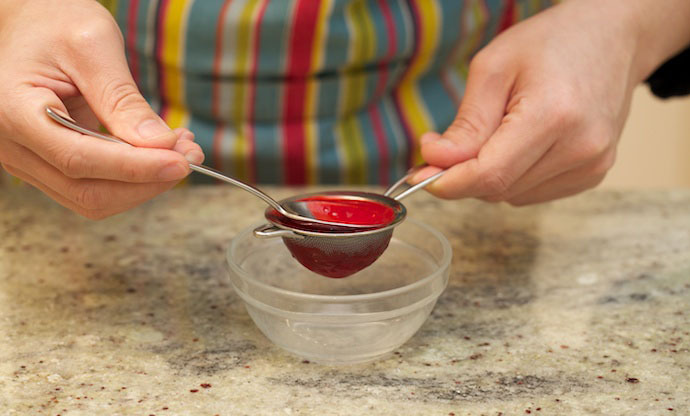 Put the raspberry puree into a small saucepan (the smaller, the better myself! ), and add five teaspoons of sugar. 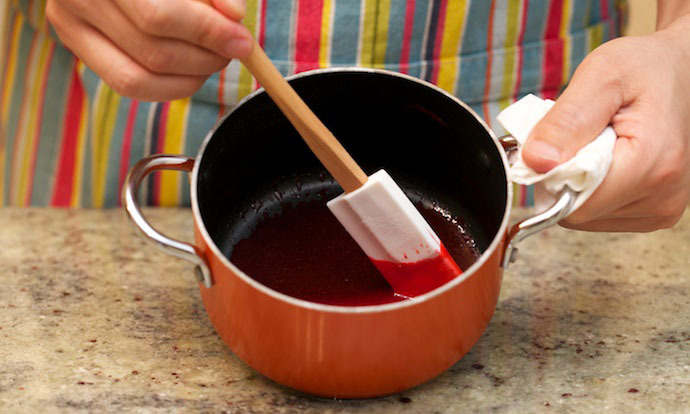 Heat gently until bubbles appear at the edge of the pot then add the lemon juice and gelatin mixture. 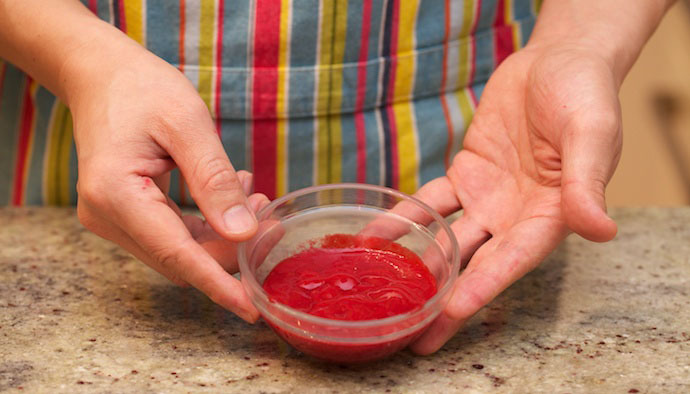 Stir continuously to avoid lumps forming until the gelatin completely melts, which should take about 1 minute. Put the saucepan aside to cool to room temperature. This should take about 20 minutes. Pour the cream into a large bowl and add the other two teaspoons of sugar. 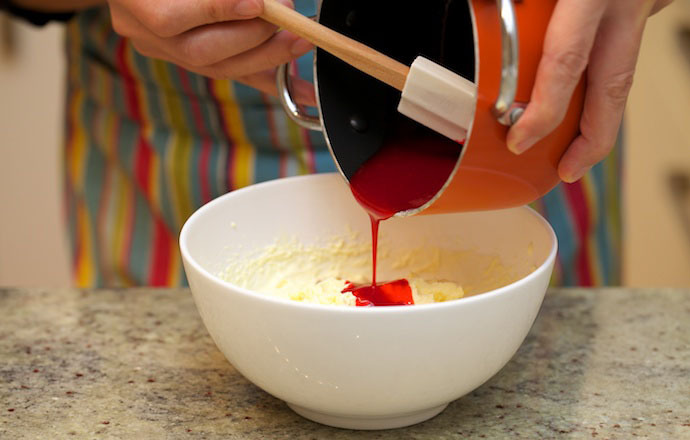 Whip the cream either by hand with a whisk or in your mixer using the whisk attachment. As for the degree of whipping, personally, if it is too much, the cream begins to taste more fatty than light. 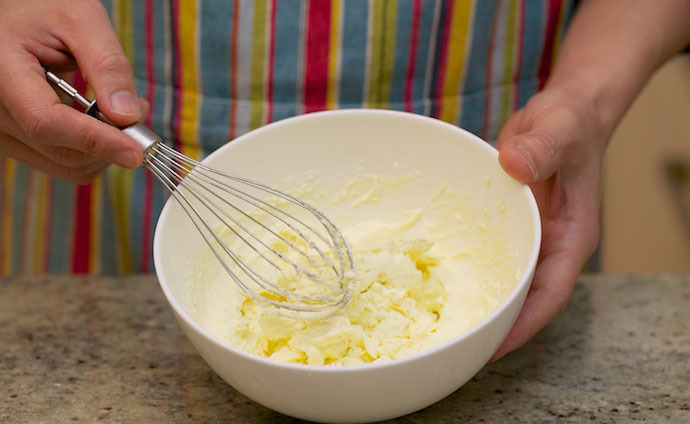 Over whipping can also quickly cause the cream to split (curdle) which is almost impossible to fix. As long as the cream has some firmness, and can maintain its shape, it is whipped enough. 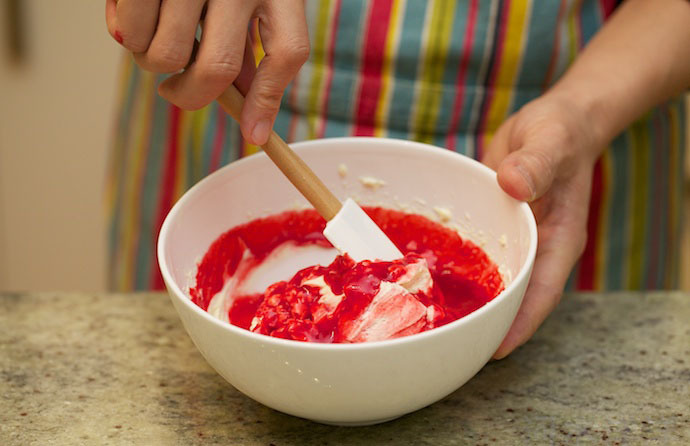 Pour the cold raspberry gelatin mixture into the cream. And gently fold it in with a silicone spatula. Once they are mixed to a uniform pink, stop mixing. Do not over-mix. Spoon the mousse mixture into the bottom of the mold on top of the cookies and smooth the surface with a spoon or knife. 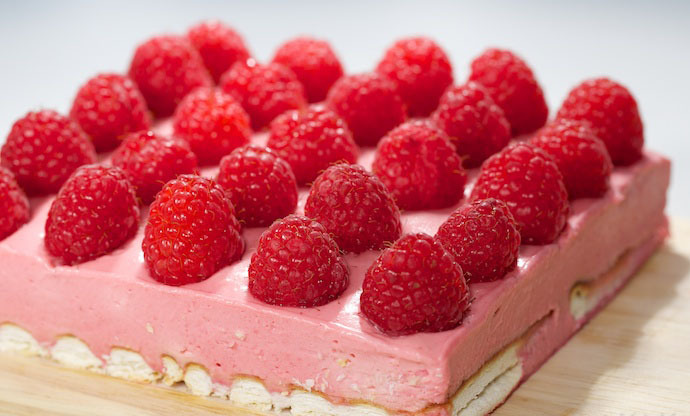 Rinse the fresh raspberries, blot the surface, and neatly arrange on top of the cake. Although the cake is already pretty tempting now, it’s not ready to eat yet! All mousses need to set, so cover it with plastic wrap and pop it in the refrigerator for at least three hours, preferably overnight. 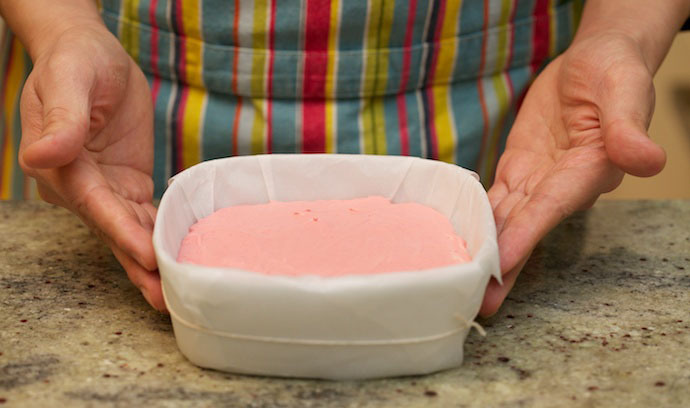 Grab the sides of the baking paper and gently pull the mousse cake out of the mold. It’s so pretty that it seems a shame to cut it, but cut it you must. However, before enjoying, admire the pink deliciousness sitting on your bench for a moment, anticipating the goodness. Mousse cake has a lot of scope for creativity and has been the basis of many food trends over the decades. The versatility of mousse allows a savvy chef to showcase his creativity and skill. Mousse cake always features in the World Pastry Cup, which has helped it rise to a world favorite.